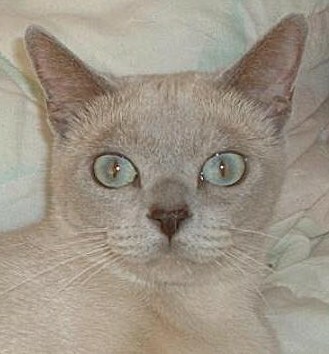 The Tonkinese is a stunning feline, attracting attention for its appealing physical appearance & engaging personality. 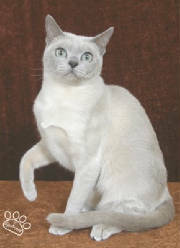 This breed blends the distinctive characteristics of their Burmese & Siamese relatives, resulting in a cat with their own unique identity. Point - high contrast, Mink - medium contrast, & full color/solid with low contrast. Eye color ranges from blue to aqua to green or gold/green. They have good muscular development & although sleek looking, are surprisingly heavy for their appearance. Tonks are people oriented cats, & want to be with you all the time. They are warm, loving, mischievous, active & athletic. They are frequently known to fetch and shoulder ride. Tonks do talk, but not excessively. They usually adjust well to other animals in the household. Care should be taken to train your Tonk before he trains you! These cats are intelligent & master manipulators. It is essential to keep them indoors, as they have NO outside survival skills. Their fearless curiosity can lead to injury or fatality outdoors. Tonks are fabulous cats & the very best companions. Once you have been owned by a Tonk, you are hooked forever. We hope you enjoyed this page. Be sure to look at the other pages.